Fast forward a few years and we find ourselves in the unassuming Studio Geisha Cafe in Morishita, suburbia Tokyo, ready for our own transformation and experience of a lifetime. “50% of our customers are in fact Japanese men, mainly heterosexual, who simply want to transform into something completely different”. Michiru, a former model/actress, set up the Studio Geisha Cafe with her husband to provide people the chance to live out their dream. 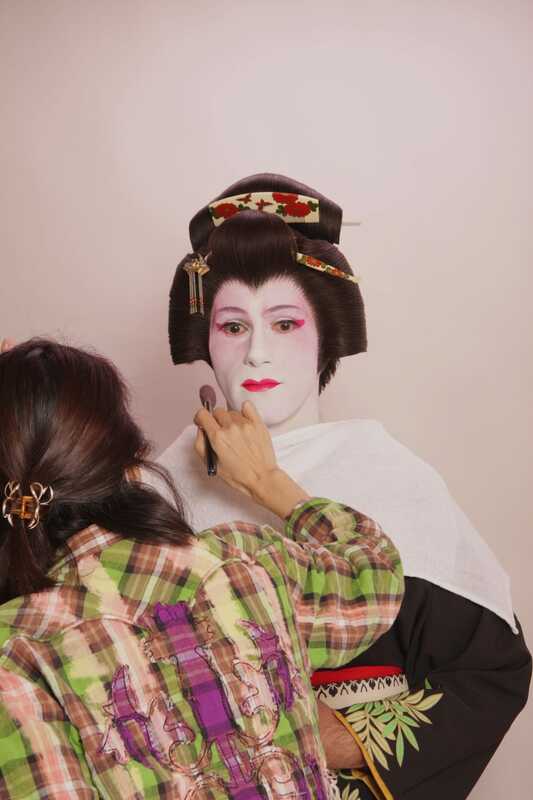 She's used to Japanese men who want to be transformed and we were fortunate to be her first foreign male geisha. For those who've been following us, you'll know we love to seek out extraordinary experiences, like that one time we learnt to pout and swim like mermaids on Boracay. 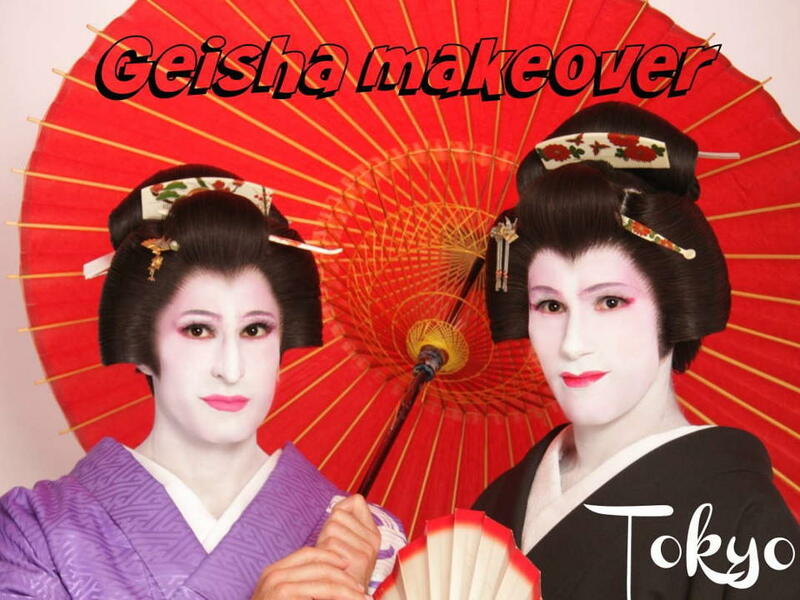 So imagine our jubilation when we discovered geisha makeover in Tokyo. Before proceeding any further, we want to make it quite clear this is not in anyway intended to mock or poke fun at the Japanese geisha culture. Our intention is simply to discover more about it and celebrate this beautiful, fascinating and wonderful cultural facet of Japan. 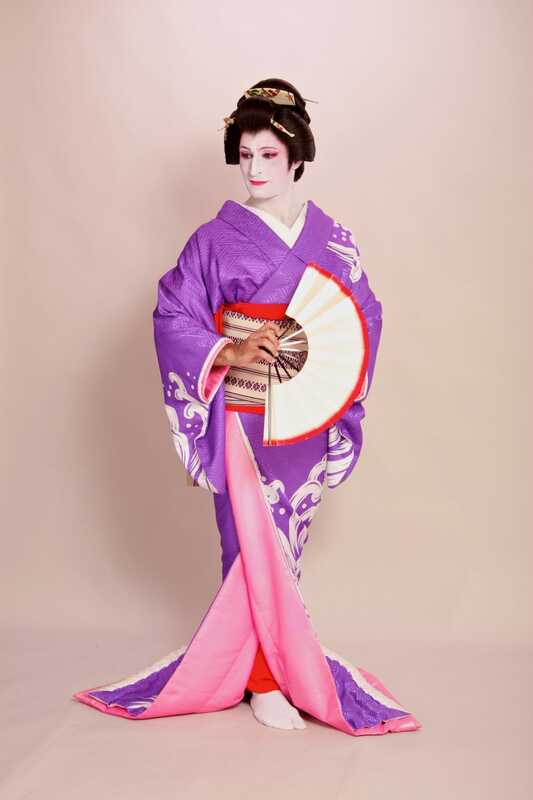 Geisha comes from two words, gei and sha which translates to art person. The young geisha apprentice is called meiko, meaning dance child. 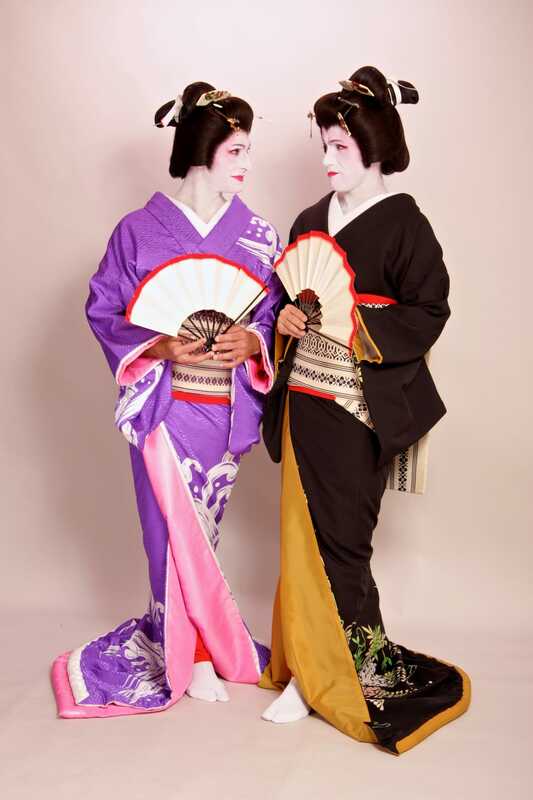 Historically, geisha are entertainers who perform various arts like classical music, dancing and games. But the original geisha were in fact men not women! 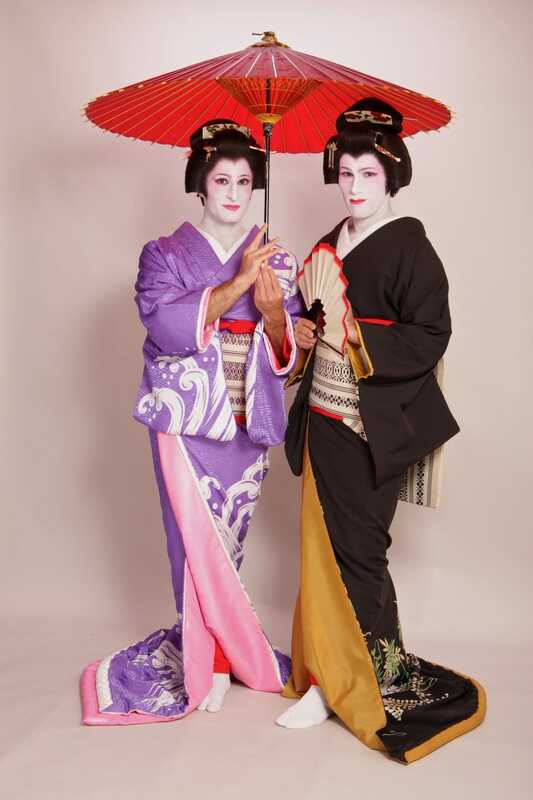 The original geisha was male advisors and entertainers to their daimyo (feudal lords), dating back to the 1200s. They were tea connoisseurs, artists and gifted story tellers. The first female geisha didn't appear until 1751 but grew so quickly in popularity that they soon outnumbered their male counterparts. Today, there are 5 known (male geisha) in Japan according to Wikipedia (4 in Tokyo and 1 in Kyoto), like Senzo Sakuragawa. Geisha spotting in Tokyo: can you spot the Nomadic Geisha? The make up transformation along with dressing up in the elaborate geisha kimonos took around 2 hours, plus a further hour for the photo shoot. i. First we had to shave! 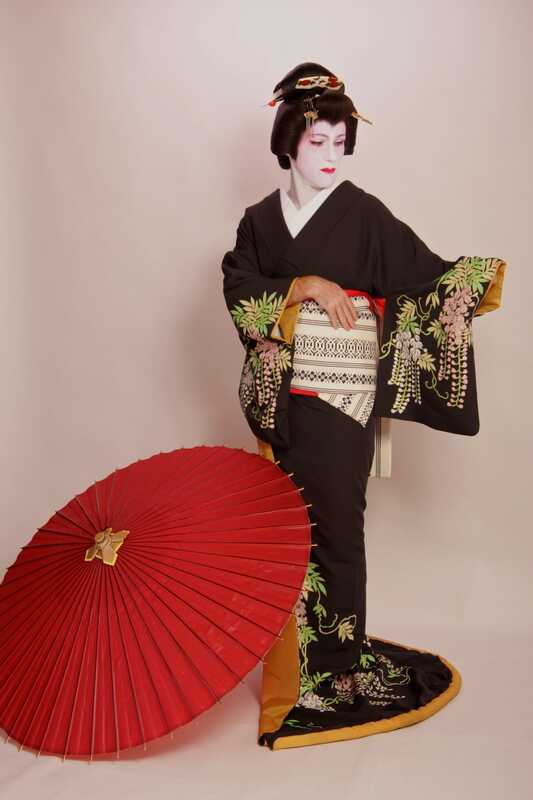 The Studio Geisha Cafe has a selection of beautiful traditional kimonos to try on. 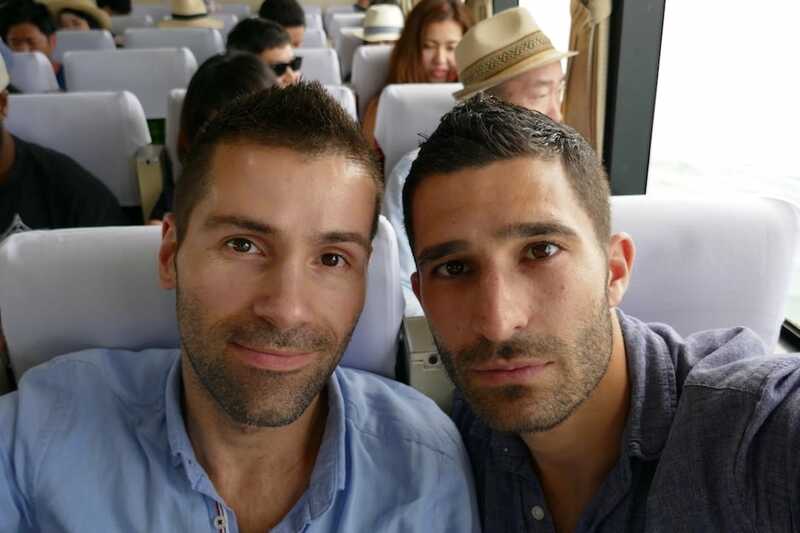 Stefan chose his favourite colour (mysterious purple) and Sebastien the more chic, classical black. 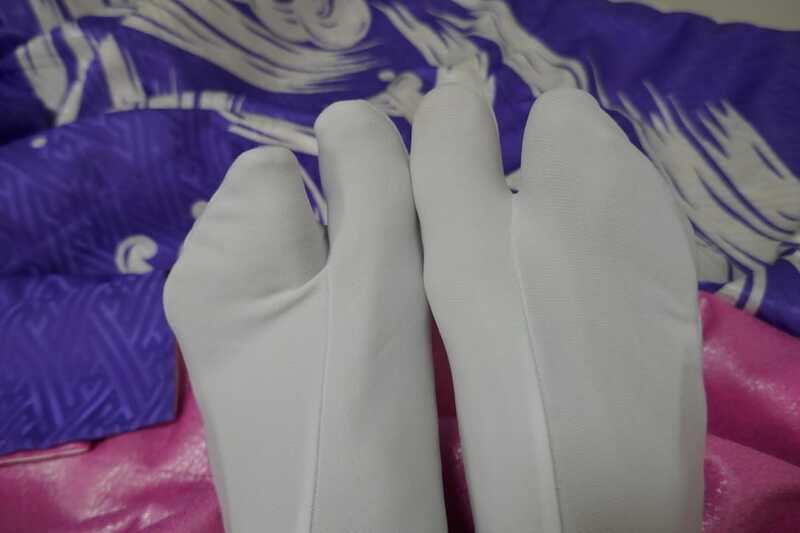 We then had to undress to put on the hada-juban undergarment and the unique geisha pabi socks. 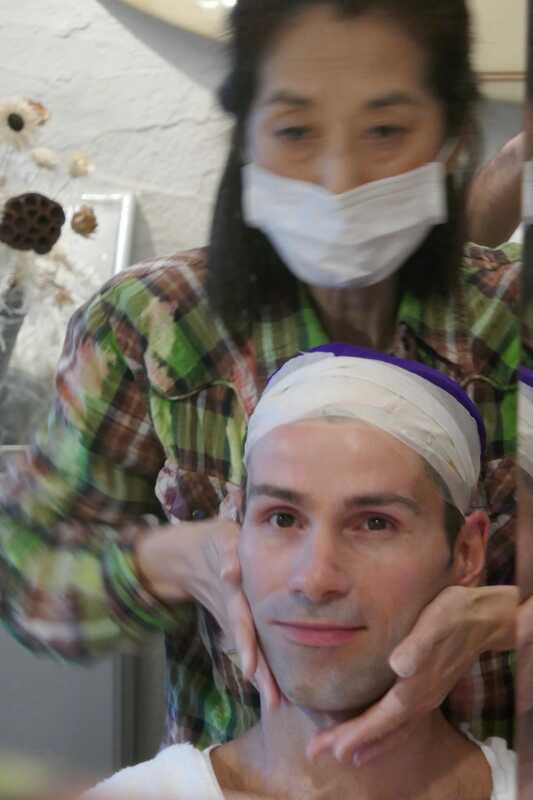 Before make up, the correct geisha wig had to be selected and fitted. The wig was then put aside and an under layer taped to our head, ready for make up. 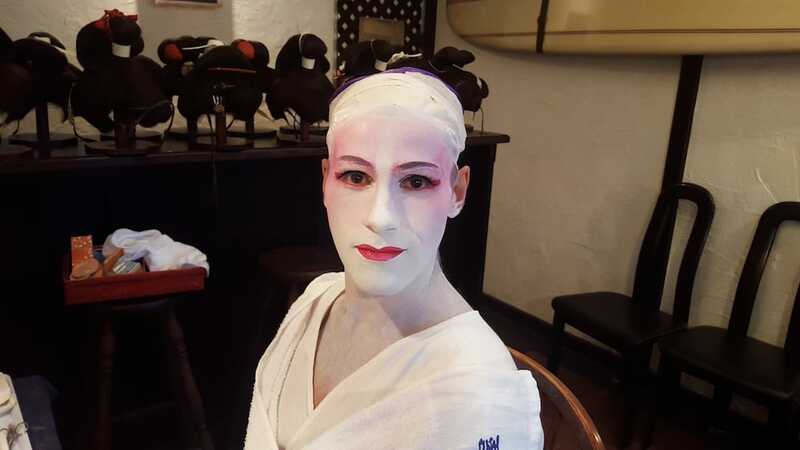 The Studio Geisha Cafe works with specialist artist Kyoko Matsushita, who has a lot of experience doing make up for men (and women). A special oil (bintsuke abura) was applied, followed by a white mayu-tsubushi wax to hide the eyebrows and a few layers of foundation to hide beard shadow. Powder was then applied to set the foundation, followed by the shironuri white paste makeup along with red lipstick and eyeliner touches. The shironuri white paste, so commonly associated with geisha, is a tradition from the days when there was no electricity. It was used to showcase a young beautiful face in the dark candle lit rooms. Does this geisha shironuri make up showcase this young (!!) beautiful face? After make up, we were ready to put on our kimonos, have our wigs re fitted and prepare the pouts for the cameras. Traditionally, teeth are hidden by Japanese girls when smiling as it's regarded as impolite, which is why they cover their mouth when laughing. This suited the pouting Seby-Yakko just fine! An occasional flash of red from the undergarment is a subtle way to titillate: red is historically meant to drive Japanese men wild with passion, so geisha expose it every now and then, ever so coyly, to woo their audience. 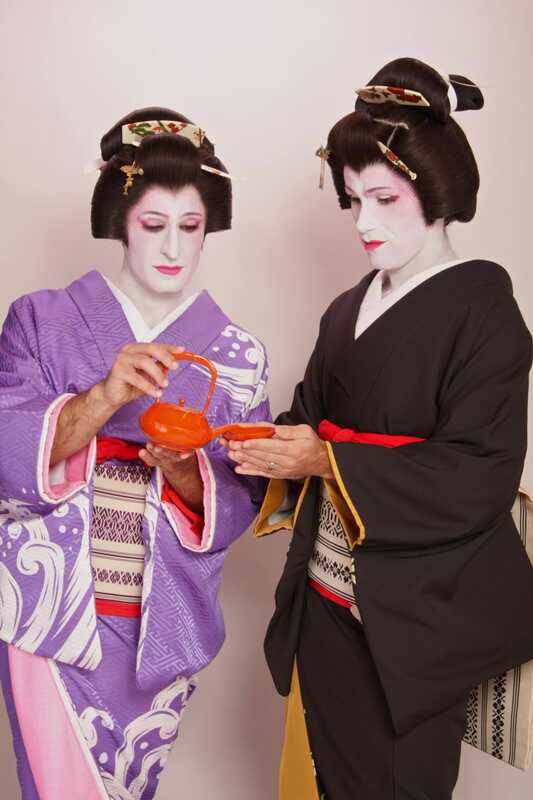 If you too want to transform into a geisha, we highly recommend Michiru and her team at The Geisha Studio Cafe. They can also dress you up as a samurai and offer wedding makeovers for both men and women. Internet access: most public places in Japan will have public WiFi available. But if like us you want unlimited fast internet on the go everywhere you are, we recommend renting a pocket WiFi router. Thanks buddy- definitely check out geisha cafe in this article, they’re brilliant! This is one of my favourite posts on your site so far! What an incredible, unusual experience. I didn’t think anything could top your mermaid outfits but your geisha look is stunning. wow that is such a cool experience. SO glad you did it or else I would have never know about this. You guys never fail to blow my mind. LOVE this. Seriously, could I love your adventures any more?! I love that you dove into this with everything! You look fantastic – I had no idea that that was you guys! Thanks for sharing about your transformation into this beautiful part of Japanese culture. Oh my goodness, this is great! You guys look absolutely amazing. And I had no idea there were male geisha – that’s so interesting! Oh my gosh, you two are funny and cute, and I do think our whole family would love to play dress-up here. Did you just dress up for pictures, or was there more to it? Thanks Cassie 🙂 Would LOVE to see your pics of it! I nearly fell off my chair when I opened your newsletter! Of course you guys make it a bit humorous, but wow so fascinating! Excellent read! Ha ha ha – thanks Aunty V!!!!! This is indeed a unique experience and your post offers some fascinating insights into this Japanes practice. You guys always find the most fascinating things to do! This is no exception. Who knew how lovely you can be? Very neat guys. You Rock! You book look amazing! I absolutely love this. This is he first time that I have read about the transformation process as well, which is super interesting. Thanks for sharing the history of geishas and your incredible experience. Our pleasure Sally, thanks for reading! This is absolutely fantastic! I’m definitely signing up when I’m in Japan! I didn’t know the original geisha were men! Movies/pop culture only show women. I’m glad you put in the quick word about cultural appropriation because I’ve been in heated discussions where people think dressing up in other culture’s traditional garb is wrong. But as a Korean-American, I love it when others dress up in Korean traditional clothes. It’s fun!